(1) Robust scientific evidence shows the sun angle controls water vapour content of the atmosphere, the main component of back radiation, as it cycles annually. 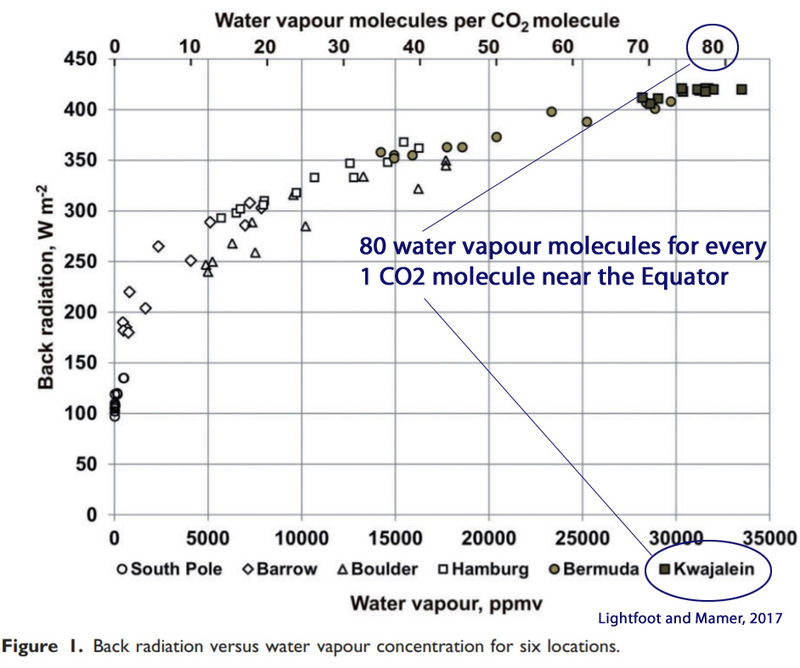 (2) Water vapour content measured as the ratio of the number of water molecules to CO2 molecules varies from 1:1 near the Poles to 97:1 in the Tropics. The H2O/CO2 ratio along the top of the plot is based on a CO2 concentration of 400 ppmv. Because water vapour is the most abundant GHG, it is reasonable to plot water vapour concentration against back radiation. … It is evident from Figure 1 that (1) the upper limit to the back radiation of GHGs is approximately 420 W m2 at water vapour concentration of approximately 32,000 ppmv, or an H2O/CO2 ratio of 80 [to 1]; (2) the lowest back radiation is 97 W m2 at the South Pole and (3) small increases in water vapour give the most increase in back radiation above the Arctic and Antarctic circles because of the steepness of the curve. These [polar] areas together are only 8.4% of the Earth’s surface and have little effect on the Earth’s average atmospheric temperature. The sun angle determines the H2O/CO2 ratio … There is little sunlight in winter above the Arctic Circle, such as at Inuvik, Canada, and the average H2O/CO2 ratio is as low as 1:1. In summer it rises to an average maximum of 29:1. … The highest sun angle corresponds to the highest H2O/CO2 ratio of 29:1 and the lowest angle to the lowest of 1:1. The H2O/CO2 values for Singapore and Nairobi also show the highest ratios occur at the highest sun angles. The difference in H2O/CO2 ratios between summer and winter is larger towards the Poles and smaller towards the equator. The levels of both the summer and winter ratios depend on whether or not there is a relatively warm ocean nearby to provide the water vapour. (3) The effect of back radiation [water vapour] on Earth’s atmosphere is up to 200 times larger than that of CO2 and works in the opposite direction. The actual CO2 concentration experienced at any specific location is determined by the physical gas laws discovered by Boyle and Charles. For example, the elevation of Boulder, Colorado, is 1655 m, the average July high temperature is 33°C and the average low in January is 2°C. The calculated CO2 concentrations based on 407.9 ppmv in dry air are 298.0 and 336.4 ppmv, respectively. The RF [radiative forcing] of CO2 in July at 298.0 ppmv is 5.22ln(336.4/298.0) ¼ 0.63W m2 lower than in January at 336.4 ppmv. While the RF of CO2 was falling by 0.63W m2 from January to July, the back radiation was increasing by 110 W m2 from 240 to 350 W m2. From July to January the situation reverses. This shows back radiation [water vapour] acts in opposition to the warming effect of the CO2, is larger by (110/0.63) = 174 times at the peak and overrides any effect by CO2 on atmospheric temperature. If there is a warming effect by CO2 on the atmosphere, it is too small to measure and can be considered as being negligible. In fact, it is fair to say there is virtually a complete disconnect between the concentration of CO2 in the atmosphere and atmospheric temperature. We show that a comprehensive analysis results in relegating [CO2] to insignificance as a determinant of climate change, and that atmospheric water vapour arising almost exclusively from nonhuman sources is by far the largest source of radiative forcing and temperature change. … The failure of the regression to reveal any contribution of changes in [GHG] to changes in Gistemp’s GMT anomalies is obvious both from Figure 1 and from Table 2, which shows total statistical insignificance because with t < 2.0, and 𝑃>0.05, the critical values are not attained. These results validate the null hypothesis from Hegerl et al. that there is no discernible and statistically significant causation of global temperature change attributable to the radiative forcing from anthropogenic changes in noncondensing GHGs. … [O]nly the [H2O] variable is statistically significant, accounting for more than 90 per cent of the changes in mean maximum temperature over the period 1960–2006. … [H2O] accounts for more than 90 per cent of temperature change near where C. D. Keeling began his measurements of the atmospheric concentration of CO2 back in 1958. [W]ater vapor is the most potent greenhouse gas because it absorbs strongly in the infra-red region of the light spectrum, first demonstrated by Tyndall (1861), despite the conventional view that because the water vapor content of the atmosphere will increase in response to warmer temperatures, water vapor is only a feedback that merely amplifies the climate warming effect due to increased carbon dioxide alone. In reality, the [H2O] variable in the NOAA’s database proves to be a remarkably powerful determinant of climate variability over the period from 1960 to 2006 not only at Barrow but across all USA, as it is always highly statistically significant at better than the 95% level of confidence for both annual mean minimum and maximum annual temperatures. This is hardly surprising, if only because in reality, as Tans has noted, “global annual evaporation equals ~500,000 billion metric tons. Compare that to fossil CO2 emissions of ~8.5 billion ton C/year,” and even the total level of [CO2] is only 827 billion tonnes of carbon equivalent. It would seem to be a case of the tail wagging the dog if the additions to [CO2] from human burning of hydrocarbon fuels have raised global temperatures enough (just 0.0125°C p.a. [per year] since 1950) to generate annual evaporation of 500,000 billion tonnes of [H2O]. Estimates of the atmospheric temperature changes due to a doubling of CO2 concentration have be with a standard radiative flux model. They yield temperature changes of >0.25 K. It appears that the much larger changes predicted by other models arise from additional water vapor evaporated into the atmosphere and not from the CO2 itself. … It is important to stress…that CO2 is not the main constituent involved in infrared transfer. Water vapor plays the major role and ozone is also of importance. … Twenty of the spectral intervals are dominated by water vapor and the other two contain CO2 (~15 µm) and O3 (~9.6 µm), although overlap with water vapor is also included. Calculations were performed for CO2 concentrations of 330 and 600 ppmv, taking care to include the changed CO2 concentrations also in the near-infrared solar absorption (cf. Newell et al., 1972). Both sets of computations were also repeated with cloud absent. The infrared flux dominated by CO2, as is well known, is only about 10% of that controlled by water vapor. Scientists are still debating the reasons for “global warming”. The author questions the validity of the calculations for the models published by the Intergovernmental Panel on Climate Change (IPCC) and especially the future scenarios. Through spectral calculations, the author finds that water vapour accounts for approximately 87% of the greenhouse (GH) effect and only 10% of CO2. A doubling of the present level of CO2 would increase the global temperature by only 0.51 °C without water feedback. The distribution of the radiating gases is largely responsible for the layering of the Earth’s atmosphere. The troposphere extends from sea level up to approximately 12 km at which point the temperature has dropped to approximately -60°C. Water vapor is about 10 times more important than carbon dioxide, both for radiative heating by absorbing solar radiation and for radiative cooling. In the stratosphere, however, radiative heating by the absorption of solar radiation by ozone is dominant. The explanation for climate change is still searching for an experimental proof and the most important question is whether climate change is anthropogenic. According to the Intergovernmental Panel on Climate Change IPCC global warming is mostly man made due to the increasing CO2 concentration. In this work we study the contributions of humidity and clouds to the surface temperature. We will show that changes of relative humidity or low cloud cover explain the major changes in the global mean temperature. We will present the evidence of this argument using the observed relative humidity between years 1970 and 2011 and the observed low cloud cover between years 1983 and 2008. One percent increase in relative humidity or in low cloud cover decreases the temperature by 0.15 °C and 0.11 °C, respectively. In the time periods mentioned before the contribution of the CO2 increase was less than 10% to the total temperature change. As it is known, CO2 has intensive absorption bands in the infrared region of spectra, but only one of them (about 15 µm) is of considerable importance in transferring heat radiation. … When water vapour is present in large quantity (w > 2 cm), absorption of radiaton is almost quite independent from CO2 content. Gees, no wonder no-one has ever been able to present any evidence of CO2 warming !! How could this paper (Lightfoot and Mamer, 2017) get pass any peer review? It looks like the author hasn’t considered that the amount of back radiation of greenhouse gases is a function of the surface temperature because … you know … it is radiating back. Every conclusion of this paper is based on this mistake and therefore worthless. Regarding water vapor as the dominant greenhouse gas (it is): what causes water vapor concentration to increase? Higher temperatures? And more water vapor causes higher temperatures? Why is this not causing a runaway greenhouse effect? We start by plotting the empirical relationship between water vapour concentration and back radiation, which is measured in units of Watts per square metre (W m2) as in Figure 1. The difference in radiative forcing (RF) between two concentrations of CO2, also measured in units of W m2, is already known over the area of interest and, is expressed as RF ¼ 5:22ln CðÞ ð =Co 1Þ where 5.22 is a constant, RF is the difference in RF, or warming effect, between two concentrations of CO2, C is the higher concentration of CO2 and Co is the lower concentration. Section 6.3.5 of the IPCC Third Assessment Report5 gives the constant as 5.35. However, to obtain 1.66W m2 in Figure SPM.2 of the Fourth Assessment Report (AR4) the IPCC appears to have used a constant of 5.22. This is the constant used in this study. Back radiation is the term used in FAQ 1.1, Figure 1 (p. 96), of AR4 to describe the energy radiated back to the Earth (RF) by the total of all of the greenhouse gases (GHG) including water vapour, CO2, methane, nitrous oxide and the smaller trace gases. In Figure 2.11 of AR5, this radiation is referred to as ‘thermal down surface’ and in the text of AR5 it is referred to as ‘Downwelling Longwave Radiation’. To avoid confusion and provide consistency, we use the term ‘back radiation’ throughout this study. Back radiation, water vapour concentration and atmospheric temperature follow the sun angle daily and over the seasons, increasing as the sun angle increases and falling as it decreases. Water vapour concentration is measured as parts per million by volume (ppmv) or by the ratio of the number of water vapour molecules for each CO2 molecule (H2O/CO2 ratio). The mistake is yours seb. You basically have zero understanding of how the atmosphere actually works. You show no intention of ever trying to learn even the basics. H20 is basically the only gas that has re-emits in the lower atmosphere. CO2 does not emit until above 11km. Its basic physics, seb.. but obviously WAY beyond you. Do you need someone to explain it to you again? You obviously won’t be able to, except by some Fantasy mumbo you dream up. Lower atmosphere is TOTALLY h2O. and stop your child-minded attention seeking. I need more material for the comedy routine you are (inadvertently) providing me with. A couple of points about your questions at the end: the curve is logarithmic, so increasing levels of atmospheric H20 produce smaller and smaller rises in temperature. That’s one thing that keeps it from becoming a runaway greenhouse effect. Another is that H2O evaporation cools the surface. That latent heat is then released high up in the troposphere when the H2O condenses back into water, as fluffy white clouds. Those white clouds also reflect incoming solar radiation. The iris effect, if you will. There is no danger of a runaway greenhouse effect – it’s a self-regulating system of negative feedbacks that keeps everything in check. Just consider when 1kg of water vapor condenses it releases approximately 3000 times more heat energy than 1kg of warm CO2 cooling by 1°C. That’s an assumption. The paper above is science. Please take your assumptions elsewhere and answer the scientific points raised in the above paper. Perhaps the answer is because the climate scientist’s models and assumptions behind the models are wrong? The paper above is science. Oh please … the author is aiming for a specific conclusion and intentionally or not confuses seasonal forcing variations with the overall change in forcing from increased CO2 year over year. I’d very much like to read the peer reviews for this paper. The author writes that from January to July CO2 back radiation/forcing changed by 0.63 W/m² while water vapor back radiation changed by 110 W/m² and thereby declared that both forcing work against each other. That’s playbook anti-science . The real question would be what the forcings from January to January in the following year are or better yet, the average forcing for the whole year and the next one. Does water vapor back radiation decrease by more than the CO2 forcing increases when you look at these timespans? Sorry, meant to write 110 W/m² in the other direction. Lightfoot isn’t credible…he’s a mechanical engineer. What’s that you say, Bill Nye is a mechanical engineer? I rest my case. NASA Director Gavin Schmidt is a mathematician. And he believes humans are 110% responsible for the temperature changes since the mid-20th century. Literally. And the 97% John Cook is a wannbe Nazi. And his paper (ohh, hahahahahah 😉 😆 ) was pal or peer reviewed? I would suggest that you are employing the use of the genetic fallacy as is the argument against Bill Nye. What has that “mechanical engineer said that was scientifically constructive? This is clearly incorrect. Water vapour content of the atmosphere is a function of temperature. Non-condensing GHGs (e.g. CO2) set the temperature. The ‘absolute’ amount of water vapor in a parcel of air depends on the ambient temperature. Note the word absolute. There does not need to be any water vapor in the air at all. The temperature of the air is set by the incoming solar radiation which heats up the ground and the air/atmosphere is warmed from the bottom up by convection, radiation etc. Greenhouse gases (of those are less than 0,05 % in the atmosphere) do not determine the temperature of the air in any measurable or noticeable way. Water vapor, visible in cloud form, can block incoming warmth from the sun and block outgoing warmth from the earth to space at night. A meteorology course will teach you this. I see, and what about the invisible form? What about the other non-condensing greenhouse gases? You seem to be certain that IR absorbing gases don’t have a measurable effect. Where does this certainty come from? Any experiment you’d like to share? Is there any basis in physics that this claim might have? What is the measurable effect of IR absorbing gases on ocean temperatures, SebastianH? Do you have an experiment with physical measurements? For example, if CO2 concentrations over a body of water were reduced by -10 ppm, how much cooling would occur in that body of water? What do the real-world experiments that you are aware of say? Does that evading reply mean there is no basis for his claims? No. It means I’d like you to finally answer the question (after 8 months of asking you this) as to how much real-world (physical measurements, observational experiment) warming or cooling occurs in water bodies by raising or lowering CO2 concentrations by, say, +/-10 ppm. You asked for real-world experimental evidence/physical measurements from John; shouldn’t you be capable of providing this yourself for CO2? If not, why not? What are you basing your position that CO2 is the dominant cause of ocean temperature changes since the 1950s (a whopping 0.09 degrees C) on if not real-world evidence? What would you base your theories on when it is difficult to do an experiment to confirm them? On experiments that confirm the effect of parts of the theory and physics? I certainly wouldn’t invent things that are supposed to work against the laws of physics, just for the purpose that I could argue with it against something I don’t like to be true. If I were to test the hypothesis that CO2 heats or cools water when increased or decreased over a body of water, I would actually conduct an experiment using CO2 variation and water and by controlling all the other influencing factors that might contribute to water temperature change. This way I could glean actual physical measurements that could provide evidence for my position. That’s what science is all about. Not presupposing something is true and then looking for correlations that could possibly be elevated into “causes” to “confirm” those presuppositions. Find or create two empty and identical glass-covered greenhouses (or other transparent buildings) that are located side-by-side, with neither structure affected differently by trees or shade or other outdoor environmental conditions. Inside each building place matching containers (large, preferably) filled with the same amount of water in each. Measure the baseline conditions of water temperature with precise thermometers, and measure the baseline CO2 concentration each building — which will presumably be the same or similar in each. In the first building (control), do not alter the internal natural CO2 concentration, but leave it at baseline (somewhere close to 400 ppm). In the second building, inject incrementally increasing quantities of CO2 (e.g., 500 ppm, 1,000 ppm, 1,500 ppm) with a CO2 generator (which are used in greenhouses to stimulate plant growth). Use a CO2 monitor (also used routinely in greenhouses) to measure and control the amount of CO2 contained in the experimental building. After a specified time lapse, measure the water temperature change, if any, for both the control building and the building with added CO2 from identical depths and locations for each container. Finally, reverse the process and incrementally draw down the CO2 injection in the experimental building while again gauging water temperature changes for each building. 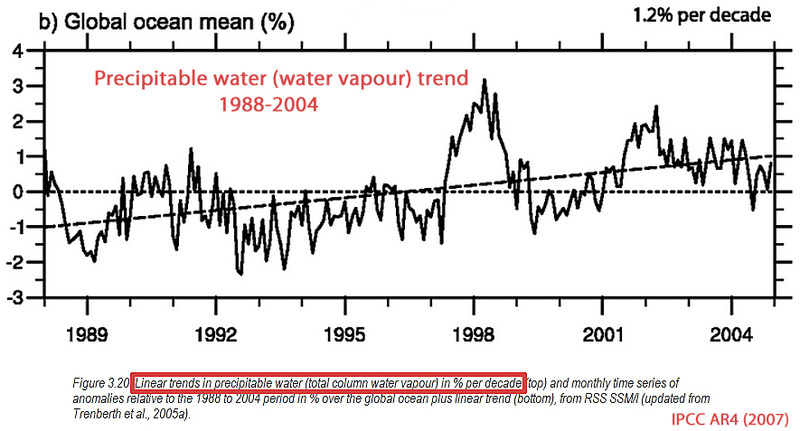 The effect of water vapour is easily measureable, and easily sensed, because it happens in the lower atmosphere. As you have proven many times, even to yourself, there is NO provable, or measureable warming from CO2 in the lower atmosphere. So if CO2 sets the temperature, why does the atmospheric water vapour content out-ratio CO2 molecules 80-90 to 1 near the Equator, where it’s (obviously) warm, but at the poles there are just as many water molecules as CO2 molecules? Why is the Equator warmer than the poles? And why would CO2 be the determinant of the temperature at the Equator when water vapor molecules reach 35,000 ppm there whereas CO2 molecules are still hovering around 400 ppm? You can find out the answer to your question when you’ve learned how the greenhouse effect works. It’s pretty self-explanatory once you understand the mechanism. It is obvious from your “reply” (“When you learn how the greenhouse effect works”) that you cannot answer the question. The GISS article you linked in your other post is laced with one assumption after another presupposing that CO2 is the primary control knob of temperature and making the utterly ridiculous claim that acts like a thermostat in a house. If that were true, then why does the most comprehensive temperature record (The US historical data set) show that at weather stations that have been in operation for over 100 years show absolutely no statistically significant change in temperature during the same months of the year? I downloaded the data from all 13 weather stations here in Pennsylvania and there simply is no trend in any month over more than 120 years despite the enormous increase in percentage of atmospheric CO2. If CO2 is the temperature control knob, then why does temperature drop 30-40 degrees overnight in dry, arid conditions vs. only 5-10 degrees in humid conditions? Because as experiments show, condensation in the humid environment releases heat mitigating the temperature drop – in other words water vapor. In science, the ultimate arbitrator for answering questions is experiment rather than theoretical arguments especially the failed greenhouse gas theory. There is actually not the slightest CO2 warming signature in the whole of either satellite temperature set. The slight warming has come TOTALLY from El Nino and ocean effects. Its as is the effect of the large increase in CO2 over that period was ESSENTIALLY ZERO !! Even the feeble trolls have been totally unable to provide any empirical proof of CO2 warming of the oceans or of the convective atmosphere. I can answer the question. But is the point here in this hostile environment where Kenneth ignores everything I write? If he’d understand the mechanism he’d know the answer too, so that should be the primary goal … make skeptics understand the mechanism instead of enduring endless discussion with them about something they don’t seem to understand. Everything you write is ignorant, seems only the sensible thing to do. To read too much of your junk science would just make anyone dumber. You are hardly likely to make anyone understand or accept mythical anti-science mechanisms that are based on UNPROVABLE JUNK FANTASY. ie… You have to take the AGW ‘shrooms, to be able to IMAGINE the FANTASY of seb’s mythical CO2 GHE. Ignore all real science, and just BELIEVE. !!! Yes seb, Professor Wood’s experiment shows how much effect CO2 has on temperatures doesn’t it? Sorry that you only have your brain-washed mantra, and cannot accept ACTUAL SCIENCE. You are still totally devoid of ANY PROOF of you religiously held anti-science “belief” that CO2 causes warming of atmosphere or oceans. ZERO PROOF is all you have, seb. High FARCE from the GISS crew. CO2 has nothing to do with the Earth’s temperature. So is there a peer reviewed proof that this statement from Singer, 1976 is incorrect? Or have you only that pile of GISS assumptions and wild guesses? I can only read the parts that are quoted here, the whole paper is behind a paywall. 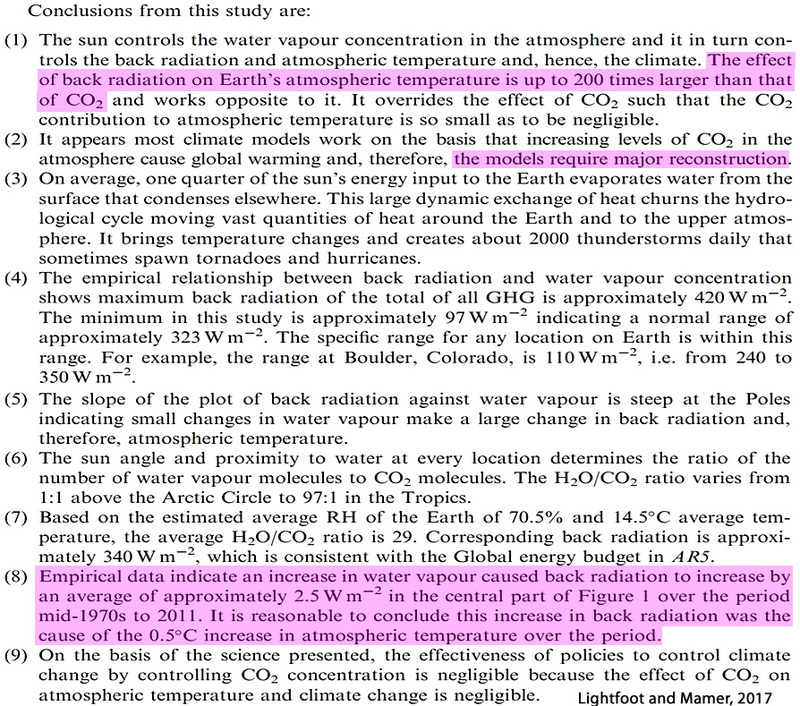 From those quotes, it is clear that the author thinks that water vapor content is a function of the angle towards the Sun and secondly the amount of back radiation depends on the amount of water vapor in the atmosphere and not the temperature of the surface (water vapor content being a function of that) together with the amount of greenhouse gases in the atmosphere. This leads to his ridiculous conclusions. P.S. : Nobody is saying that CO2 will kill us all!? Wth!? It seems to me you have rebutted your own contention. The back radiation is a function of the water vapor. It does not mater if the surface is hot or cold, the back radiation is dependent on the water vapor. If the surface is hot and the WV is high there will be more back radiation than if the surface is the same temperature and the WV is low. The cause of the WV is not important to this relationship as I see it. The amount of water vapor in the atmosphere depends on the temperature. Back radiation is a function of all greenhouse gases in the atmosphere and the surface temperature. A cold surface doesn’t emit as much as a hot surface, so less energy can be retained by greenhouse gases. CO2 does not re-emit below 11km. Why do you constantly just ignore any REAL science, seb. Is your AGW brain-washing that deep ??? Nothing left but sludge !!! And H2O is MAGNITUDES more than anything CO2 could do, even if it did re-emit below 11km. Its sad isn’t it seb.. The CORRECT conclusion, that CO2 is basically a non-entity in the atmospheric control game, is reached. You know that because you KNOW that there is no provable warming effect from CO2 of oceans or the atmosphere. You really have to dump the nonsense AGW anti-science fantasies that your mind is brain-washed with, and get back to REALITY. ‘A lot of other animals will, too,’ he added. Since humans entered an unofficial scientific period known as the Anthropocene – the time since industrialisation – we have had an effect on the planet that rivals any ice age or comet impact, he said. Fenner blames the onset of climate change for the human race’s imminent demise. No, it doesn’t show that. 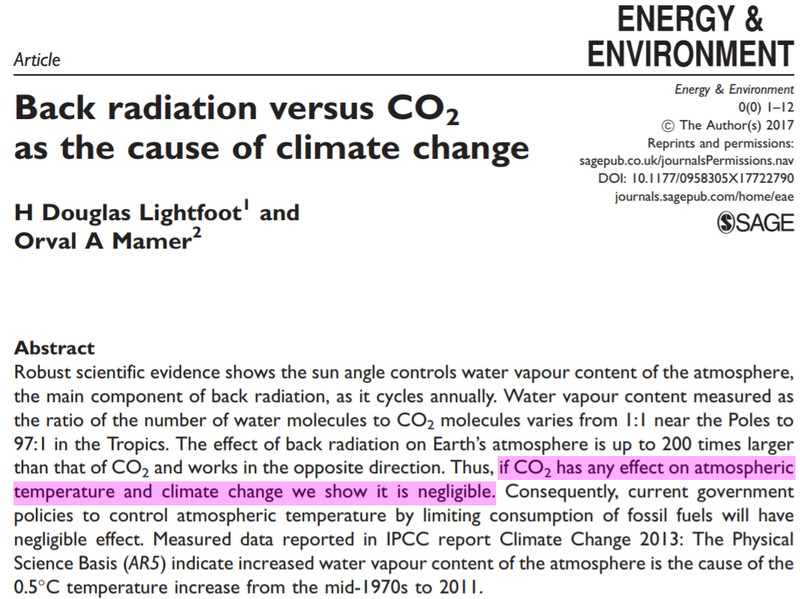 To be able to compare those two values the author should have calculated the additional forcing from increased water vapor from some baseline (as has been done for CO2). Even then it would not be comparable since these are seasonal variations. Comparing year over year could make sense. You KNOW you have been totally unable to show even the slightest warming effect from the increase of CO2 in the atmosphere. You are a miserable FAILURE at that. You have also shown that your grasp of atmospheric physics is more from FANTASY land than anywhere else. The effect of H2O is clear and measurable, you just can’t accept the FACTS, because your brain-washed, anti-science, AGW stupor won’t allow you to. The PANIC you are experiencing is because you KNOW your zombie religion is on its last legs. Pay the man and find out instead of making wild and spurious accusations. The explanation for climate change is still searching for an experimental proof and the most important question is whether climate change is anthropogenic. According to the Intergovernmental Panel on Climate Change IPCC global warming is mostly man made due to the increasing CO2 concentration. In this work we study the contributions of humidity and clouds to the surface temperature. We will show that changes of relative humidity or low cloud cover explain the major changes in the global mean temperature. And that is the point “still searching for an experimental proof”. Sorry, but as I’ve posted before on what I’ve found on water vapor, it appears to give negative feedback. It’s why deserts get much warmer during the day, and much colder at night, than humid locations at comparable altitudes and the same latitude. The effect is no doubt due to the fact that the processes involved are not so simplistic as merely absorbing and re-radiating incoming or outgoing radiation. I have a feeling that CO2 probably also gives a similar, though MUCH weaker negative feedback response. Focusing just on absorption/radiation effects is a distraction, IMO. If CO2 were effective at keeping things warm, it would probably be used in place of the vacuum in a thermos, but it isn’t due to conduction and convection vastly overwhelming any radiation effects. Just like CO2 is. High concentrations of CO2 actually transfers energy better than normal air. The tiny changes in the atmosphere make essentially zero difference. Its the function of the atmosphere, to regulate the surface temperature via the pressure temperature gradient. I believe this needs no further comment. You are nothing but an attention seeking little anti-science pest, anyway. And replies like yours, show you ignorance. It gets even worse when they are confronted by the Logarithmic effect of a doubled CO2 level,since only around 3% of the yearly emissions comes from humans,there is actually a dribble of possible postulated CO2 warming efect to brag about in the future. Since most of the postulated CO2 warming effect was already set in around 700 million years ago,there is actually very little postulated warming effect left today. I repeat myself, as well. You can lead a chatbot like SebH to data, but you can’t make it think. Oh come one, you just compared the vacuum in a thermos with the greenhouse effect. CO2 actually aids energy transfer.. like a wire aids electron transfer. Given time (and LOTS of it) you might actually figure it out. Or not. And you have, in the past, compared the atmosphere that COOLS the surface, to a blanket. You are, without a doubt, the champion of HIGH FARCE. AHHH…. so you are saying that CO2 DOESN’T emit back-radiation to keep things warm. AndyG55, please continue to show the world your misunderstanding of reality by posting comments like these … great work! OK, SebH, you have two planets, one with an atmosphere and one without. Which warms fastest during the day, and cools fastest at night, and why? Which, if any, warms most and which cools most, and why? From what you learned in the video on water vapor that I posted the link to a few days ago, does the presence of an atmosphere result in a positive, negative or no feedback? Only person showing ignorance of reality, is you seb. Its your stock in trolling…. continued wilful ignorance mixed with plaintive attention -seeking. You’re the one who believes that CO2 can heat things by back-radiation, not me. Question for clarification: do you agree that objects radiate back towards the source of the radiation? Or is that also something you “have a feeling” about that it works differently than what physicists say? Still, absolutely ZERO EVIDENCE that CO2 cause ANY warming in a convective atmosphere. Why, oh why are you SO EMPTY, seb. !! Perhaps you just FEEEEEEEL that it should. Physicists KNOW, and they LAUGH at the CO2 warming farce. IR is scattered by CO2. The earth, heated by solar radiation, emits IR photons, which results in cooling the surface. SOME of those photons are scattered back toward their source. Those that are re-absorbed by the surface result in RE-warming it. The back-scattered IR will NEVER make the surface hotter than it was originally, or even return it to the same temperature. In the absence of an external source of surface heating, the surface will cool. So, can CO2 cause the earth to cool more slowly in an atmosphere where it is present than where it is absent? Probably. But… All empirical evidence indicates that it is a VERY weak effect, at best. BOM in Australia BUSTED !!! Indeed more evidence (if any more was needed) that the whole AGW scam runs on deceit and little else. If AGW were truly scientific all adjustments to raw data would be explained. Little is known about Africa’s elusive aardvarks, but new research says they are vulnerable to climate change like many other species. Hotter temperatures are taking their toll on the aardvark, whose diet of ants and termites is becoming scarcer in some areas because of reduced rainfall, according to a study released Monday. Drought in the Kalahari desert killed five out of six aardvarks that were being monitored for a year, as well as 11 others in the area, said researchers at the University of Witwatersrand in Johannesburg. The aardvarks’ body temperatures plummeted during the night because they were not getting enough energy from diminished food sources, said physiology professor Andrea Fuller. She said they tried to conserve energy by looking for insects during the warmer daytime, but their efforts to adapt could not save them. The body temperatures of the ones that died had dropped to as low as 25 degrees Celsius (77 Fahrenheit), compared to a normal temperature of a little below 37 degrees Celsius (98.6 Fahrenheit). Researchers, who monitored the aardvarks with tiny sensors attached to implanted computer chips, said some birds, reptiles and other animals use aardvark burrows to escape extreme temperatures, reproduce and hide from predators. They could have fewer refuges available if aardvark populations shrink because of rising temperatures, they said. The aardvark, which lives in many parts of sub-Saharan Africa, is identified as an animal of “least concern” on an international “red list” of threatened species. The list, compiled by the International Union for Conservation of Nature, said there are no indications that the population is changing significantly in southern Africa, though it speculated that numbers may be declining elsewhere because of habitat destruction, the bushmeat trade and other factors. Estimating aardvark populations is guesswork, Fuller said. “Very little is known about them because people hardly ever see them,” she said. (booklet printing, printing in China). I also understand that roast aardvark is darn good eating! Further to that if the aardvark has evolved to stay in one place despite it’s major food source moving it deserves the same fate as all the Iberian big cats that are now extinct. Subfossil records that indicate that Lynx pardinus occurred in central and western France until c. 3000 years ago. Surprisingly, with reservations on the determination of the bones (by J. Altuna), both lions and cave lions seem to be recorded in the Iberian Peninsula in the Late Glacial. There are published records of the lion (Panthera leo) in the northern Iberian Peninsula from the early Holocene. However, its presence in Europe on the basis of subfossil records was proven initially from the Atlantic period. In Ponto-Mediterranean regions of Europe, the lion is recorded from the Atlantic to the younger sub-Atlantic. However the ongoing natural climate variation that ensued (that they these big cats failed to properly adjusted to) ensured their demise. Extinctions are a natural process, whether humans cause them or not. Big Al and his mates have done ok, from this climate change malarkey, don’t you worry about that. Survival of the scumist !! You mean the supplied cooking container? Another FUN and FACT filled post on WUWT. Plenty of enhanced atmospheric CO2 for decade, probably centuries, to come. They can fiddle around the edges with unreliable expensive environment polluting so-called renewables, destroying their local energy supply systems, like Germany has (with basically zero CO2 reduction impact), or they can realise that coal(with gas and oil) are, and until some miracle of energy supply occurs, will ALWAYS be the preferred source of RELIABLE, CHEAP, LIFE-GIVING energy. WINNING! MAKING THE WORLD LIVABLE AGAIN! But Andy India is not a rich Western democracy with many miseducated sheeple, so for the UN they can burn as much fossil fuel as they like for as long as they want. Some facts about “Back radiation versus CO2 as the cause of climate change” that can be verified by careful reading of the document. The science used is based firmly on the physical properties of carbon dioxide (CO2) and water vapour and measurements of their action and interaction in the atmosphere in the presence of the sun. The paper makes unique and innovative connections between several branches of science. As an example, the paper states there is a connection between back radiation and water vapour. The specific relationship appears to be new to the scientific community. Hope this helps the current discussion. Thank you for contributing to the discussion regarding your paper, Mr. Lightfoot. You have validated the point I tried to make some years ago (about the massive inequalities in energy requirements between water and CO2). IIRC it was either on WUWT or stevengoddard (the old original stevengoddard realScience website). At the time I was roundly criticized for not looking at the IR spectrum and such-like (IMO the touchstone of over-complecated AGW science). I am heartened to see you stayed within the realms of normal observable, verifiable physics, and also that my ball-park figure of 3000 times the energy difference between evaporating water and CO2 was reasonably close. As an example, the paper states there is a connection between back radiation and water vapour. The specific relationship appears to be new to the scientific community. That’s new? I thought everyone agrees that back radiation comes from infrared absorbing gases in the atmosphere one of which is water vapor? Would you agree or disagree that back radiation also depends on the surface temperature? That the warming effects of CO2 and water vapour work against each other under the influence of the sun appears to be new to the scientific community. Because your way of comparing both is “new”. Nobody would actually do something like that, particularly because the amount of back radiation also depends on surface temperatures. You compared seasonal data and seem to be inferring that this means that both effects work against each other. Try comparing year over year data and what effects increases in both water vapor concentration and CO2 concentration have year over year. Then we are talking. H2O MASSIVELY outweighs any feeble amount CO2 could possibly do, even if CO2 did emit below 11km. ! That is why CO2 warming, if there is any, is totally undetectable. That is why you continue to TOTALLY UNABLE to produce one single paper showing that CO2 causes warming in a gravity controlled convective atmosphere. Sebastian, it is clear you have no idea what Mr. Lightfoot is talking about. CO2 has had absolutely ZERO measurable effect in the last 40 years. And real physics is totally against it having any effect, ever.. This completely destroys the global warming argument. Your WHOLE feeble existence appears to be dependant on it. You probably think you are a FAIRY rather than a TROLL. But your hallucinogenic FANTASIES just keeps on yapping and yapping. Are you getting enough ATTENTION, seb ???? Is your pre-pubescent, child-minded attention seeking, satisfied ?? Were your formative years of mental anguish really that unkind to you ? Easily triggered, are we? Why do you “waste time” (as you put it) with commenting something like this? It’s not good for your blood pressure. Why do you waste your time, and ours, with unsupportable GARBAG. Is your life really that PATHETIC? Stay on topic, chatbot. You get triggered, and you start spouting unrelated nonsense. …which proves that just because someone is super talented and indispensable in one area (without him Britain would probably have been defeated by Germany), he can be totally off the rails in another. Take yourself, for example. Just because you haven’t a clue about science in general, or climate science in particular, doesn’t mean you might not be good at something else. Anything’s possible. Just updated the Japanese temperatures to July. Japan, one of the most industrial countries, and downwind from China, the MASSIVE atmospheric CO2 supplier. ….. and ABSOLUTELY ZERO signature of any sort of warming from any influence, let alone CO2. Works on Mars and Venus, although with different relationships. And the moon. g²=units Nm² for stress, pressure and thermal resistance. ONE SHOT MANY BIRDS: http://wp.me/p25H2W-dB via @Raveendrannaray. By strictest regulations and strictest enforcement CAPTURE Concentrated DEICERS by erecting ZERO DISCHARGE SYSTEMS ( Z.D.S.) in Desalination Systems and build more ice masses & glaciers –>>>> ONE SHOT MANY BIRDS —->>>>> 3° C TEMPERATURE REDUCTION IS POSSIBLE + NO MORE ESCAPING OF METHANE FROM ICE SHELVES + NO MORE OZONE HOLES + NO MORE SEA RISE + NOT MUCH STRONGER HURRICANES + NOT MUCH CALAMITIES+ NO MORE EXTREME WEATHER + PLENTY OF DRINKING WATER FROM SEA WATER + MORE FOOD & VEGGIES + WORLD ECONOMY WILL BE GOOD –>>>>> ” AIR CONDITIONING OF MOTHER EARTH ” = WORLD PEACE.